I’ve got news: the end is near. The end of shameful rides with Bicing, of disrespectful looks coming from the fixie guys, and the population in general. The end of bicycles with brakes that don’t work, with seats that keep going down and noisy chains. I will, tomorrow, buy a proper bicycle. I’ve been following My Beautiful Parking’s (the bike shop) blog for a while and the other day I read that they are selling the stock they’ve been using for rental. I can’t speak at length today, or go on with my ramblings forever because there’s people who expect me some where but I will explain what the beauty above is about. I basically saw this guy standing in the middle of the crowed at the ‘Indignados’ demonstration in Barcelona, about two weeks ago. As you probably know, it was held on a global scale, and here in the city concentrated thousands of people. 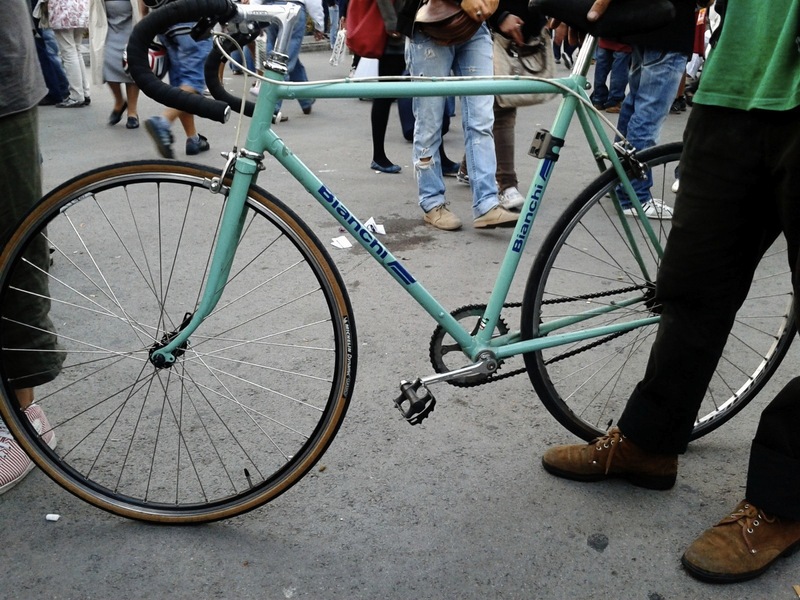 I was proud to be there, specially considering I got to see this fantastic bicycle. When I asked the owner if I could take its photo he looked at me like a was a weirdo, specially when I replied to his “what is it for?” with a “for my blog”. Then I really felt like one of this creppy hipster fashion bloggers…which I’m obviously not. Anyways, it was worth it. I think it’s really a pretty bike. If you live in Catalonia/Balearic Islands, I hope you will use this day to stuff your face with “panellets“…mmm sooo yummy. So did you get one? !